Jiangxi (江西; formerly romanised as Kiangsi) is a province in the People's Republic of China, located in the southeast of the country. Spanning from the banks of the Yangtze river in the north into hillier areas in the south and east, it shares a border with Anhui to the north, Zhejiang to the northeast, Fujian to the east, Guangdong to the south, Hunan to the west, and Hubei to the northwest. Fuzhou (simplified Chinese: 抚州; traditional Chinese: 撫州; pinyin: Fǔzhōu,[fùʈʂóu] ), Fuzhou dialect: Fú-Diù, also named as Gandong (Chinese: 赣东; literally: 'East of Jiangxi'), is a prefecture-level city in the northeastern part of Jiangxi province, People's Republic of China. The Fuzhou Prefecture-level City is located to the south of the provincial capital Nanchang, bordered in the east by Fujian Province. Its total area is 18,800 km2 (7,300 sq mi). Its population is 3,900,000 people. The area is located northwest of the Wuyi Mountains, and is drained by the Fu River (Fuhe), which flows northwest and north, to the Poyang Lake (in the neighboring Nanchang Prefecture). Because a number of scholars and statesmen have hailed from the city, it has also earned the epithet 'Cradle of Talent’ (才子之乡). Guo Shengkun (Chinese: 郭声琨; born October 1954) is a Chinese politician and business executive who currently serves as a Politburo member and Secretary of the Central Political and Legal Affairs Commission of the Communist Party of China. Previously Guo served as Minister of Public Security, State Councilor, Communist Party Chief of Guangxi Zhuang Autonomous Region and General Manager of Aluminum Corporation of China, a major state-owned enterprise.Guo is a native of Xingguo County, Jiangxi province. He has a doctoral degree in Business Administration from the University of Science and Technology Beijing. Ji'an (Chinese: 吉安; pinyin: Jí'ān) is a prefecture-level city situated in the central region of Jiangxi province of the People's Republic of China while bordering Hunan province to the west. It has an area of 25,219 km2 (9,737 sq mi) and as of the 2010 census, had a population of 4,810,339, of whom 538,699 live in the built-up (or metro) area made of 2 urban districts. Ji'an lies next to the Luoxiao Mountains (罗霄山脉) with the Gan River running through the middle of the city. Local dialects include a form of Gan Chinese (Jicha subgroup, 吉茶片) as well as Hakka Chinese. Ji'an is an abbreviation of its original name Jítàimín'ān (吉泰民安). It has also formerly been known as Luling (廬陵) and Jizhou (吉州). Jingdezhen (or the Town of Jingde) is a prefecture-level city, previously a town, in northeastern Jiangxi province, China, with a total population of 1,554,000 (2007), bordering Anhui to the north. It is known as the "Porcelain Capital" because it has been producing pottery for 1,700 years. The city has a well-documented history that stretches back over 2,000 years. Jinggangshan Airport (IATA: JGS, ICAO: ZSJA), also known as Ji'an Airport, is an airport serving the city of Ji'an in Jiangxi province, China.The airport is located in Taihe County which is under the administration of Ji'an, 30 kilometres (19 mi) from the urban area of Ji'an. The Long March (October 1934 – October 1935) was a military retreat undertaken by the Red Army of the Communist Party of China, the forerunner of the People's Liberation Army, to evade the pursuit of the Kuomintang (KMT or Chinese Nationalist Party) army. There was not one Long March, but a series of marches, as various Communist armies in the south escaped to the north and west. The best known is the march from Jiangxi province which began in October 1934. The First Front Army of the Chinese Soviet Republic, led by an inexperienced military commission, was on the brink of annihilation by Generalissimo Chiang Kai-shek's troops in their stronghold in Jiangxi province. The Communists, under the eventual command of Mao Zedong and Zhou Enlai, escaped in a circling retreat to the west and north, which reportedly traversed over 9,000 kilometers (5600 miles) over 370 days. The route passed through some of the most difficult terrain of western China by traveling west, then north, to Shaanxi. The Long March began Mao Zedong's ascent to power, whose leadership during the retreat gained him the support of the members of the party. The bitter struggles of the Long March, which was completed by only about one-tenth of the force that left Jiangxi, would come to represent a significant episode in the history of the Communist Party of China, and would seal the personal prestige of Mao Zedong and his supporters as the new leaders of the party in the following decades. Ruichang (Chinese: 瑞昌; pinyin: Ruìchāng) is a county-level city under the jurisdiction of Jiujiang, in the north of Jiangxi province, along the Yangtze River, bordering Hubei province to the north. Ruichang suffered deaths and extensive damage from the 2005 Ruichang earthquake. Ruijin (Chinese: 瑞金; pinyin: Ruìjīn) is a county-level city of Ganzhou in the mountains bordering Fujian Province in the south-eastern part of Jiangxi Province. It is most famous as one of the earliest centers of Chinese communist activity. After being forced out of Jinggangshan in the late 1920s by the Kuomintang, the Communists fled here, taking advantage of Ruijin's relative isolation in the rugged mountains along Jiangxi's border with Fujian. In 1931, under Mao Zedong's leadership, the Chinese Soviet Republic was established here, with Ruijin serving as its de-facto capital. By 1934, they had again been surrounded by Chiang Kai-shek's forces. It is from here that the famed "Long March" began.Ruijin is a popular destination for red tourism and ecotourism. It is a pilgrimage for Maoists from China and around the globe. Shangrao (simplified Chinese: 上饶; traditional Chinese: 上饒; pinyin: Shàngráo) is a medium-sized prefecture-level city located in the northeast of Jiangxi province, People's Republic of China, bordering Anhui to the north, Zhejiang to the east, and Fujian to the south; the city's western reaches extend into Poyang Lake. Shangrao had a population of 327,703 in 2010 (6,579,714 for the whole prefecture).Shangrao itself is at the very western edge of the Wu-speaking areas, while most of its associated counties speak Gan. The Xianren Cave (Chinese: 仙人洞), together with the nearby Diaotonghuan (Chinese: 吊桶环) rock shelter, is an archaeological site in Dayuan Township (大源乡), Wannian County in the Jiangxi province, China and a location of historically important discoveries of prehistoric pottery shards and it bears evidence of early rice cultivation. The cave's name refers to the legendary Chinese enlightened people, the Xian "immortals". The cave is 7 m (23.0 ft) high, 11 m (36.1 ft) wide, and 14 m (45.9 ft) deep. A 2012 publication in the Science journal, announced that the earliest pottery yet known anywhere in the world was found at this site dating to between 20,000 and 19,000 years before present. Yichun (Chinese: 宜春; pinyin: Yíchūn; Wade–Giles: I2-ch'un1; postal: Ichun) is a mountainous prefecture-level city in western/northwestern Jiangxi Province, China, bordering Hunan to the west. Yichun literally means "pleasant spring". It is located in the northwest of the province along a river surrounded by mountains. Yichun has a history of over 2,200 years. It was established in 201 BC during the Han Dynasty. Yichun has a profound Buddhist culture. 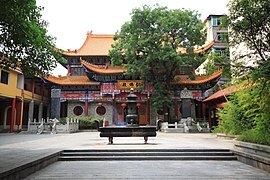 "Can Lin Qing Gui", the monastic rules for Buddhists at the Buddhist temple, originated from Yichun. Yichun is also the birthplace of a number of literary figures, such as Tao Yuanming and Deng Gu, both of whom are poets from ancient times. The transportation in Yichun is convenient. The State Highway 320, State Highway 105, the Shanghai-Ruijin Highway and the Ganyue Highway (the Jiangxi-Guangdong Highway) construct a comprehensive traffic network in the city. Yichun is a stop along the major railway running between Beijing and Nanchang, the capital of Jiangxi. Since 2014, it is also a stop along the Shanghai-Changsha CRH high speed train line, located between Changsha, the capital of Hunan and Nanchang, the capital of Jiangxi stops. Direct flights to Yichun airport are also available from Shanghai. A large sports complex with two stadiums was built in the 1990s and draws teams for sports competitions from all across China. Agriculture is the main industry but other natural resource industries such as timber and mining are extremely important for the economy. Major mineral deposits include aluminum, tungsten, gold, zinc, and copper. Yichun has abundant historical, cultural and natural tourism resources. Hongzhou Kiln, a famous kiln of the Tang Dynasty, was first built during the Southern Dynasty (AD420-589). Wucheng Site of the Shang Dynasty was discovered in Yichun in 1973. Gezhao Mountain, situated in Zhangshu, is a famous Taoist mountain in China. It is home to a number of ancient buildings. Tourists also visit the Guan Mountain Scenic Area, which is located at the juncture of Yifeng and Tonggu counties. The famous Mingyue (moon) Mountain gained its name from its shape like a bright crescent moon. Mingyue Shan can be accessed using the cable car taking to the top of the mountain. The area consists of over ten peaks which are all more than a thousand meters (about 3,281 feet) above sea level. It is also a national forest park comprising six tourist zones. Among them, the Yangshan Scenic Spot is an important birthplace of Buddhism in South China, and the Wentang Town, at the foot of the Mingyue Mountain, is known for hot springs teeming with selenium. Yingtan (simplified Chinese: 鹰潭; traditional Chinese: 鷹潭; pinyin: Yīngtán; literally: 'Eagle Pond') is a prefecture-level city in the east of Jiangxi province, People's Republic of China, bordering Fujian to the southeast. Its location near the trisection of Jiangxi, Fujian, and Zhejiang has made it a strategically important city for centuries. Today, it continues to be a major rail transport hub. It is best known as the Capital of Copper ,and here placed Jiangxi Copper and its smelting factory. Near the city of Yingtan is the resort area Mount Longhu which purports to be the birthplace of Taoism and hence has great symbolic value to Taoists. The region has many interesting temples, cave complexes, mountains and villages. Zhangshu (simplified Chinese: 樟树; traditional Chinese: 樟樹; pinyin: Zhāngshù), formerly Qingjiang County (清江县), is a county-level city under the administration of the prefecture-level city of Yichun, in the west-central part of Jiangxi Province. It has an area of 1,291 km2 (498 sq mi) with a population of 536,500. It is the first county of China Top 100 County in Jiangxi Province. The literal translation of the name is Camphor laurel, because traditionally, the city was a major commercial hub for camphor laurel oil. Zhangshu is famous for Chinese medicinal herbs. What's more, the China top 10 medicine producer Renhe Group is located there.Officially, it is the Medicine Capital of China, and there are thousands of pharmaceutical companies. Hundreds of thousands of kinds of Chinese herbal medicines are saled by bulk or by retail.